"Robert Furber, who lived from 1674 to 1756, established a famous nursery in Kensington soon after 1700, located between Hyde Park Gate and Kensington Gore. He stocked the nursery with some of the plants collected at Fulham Palace when the Bishop of London, Henry Compton, died in 1713 and by 1724 his nursery had established a notable reputation.Furber became a member of the Society of Gardeners and issued two important catalogues by 1727, but he made his name particularly with his pictorial catalogue of The Twelve Months of the Year in Flowers, which was so successful that at least six pirated publications were also in circulation as well as the official version.The remarkable set of still lifes depicting the twelve months of the year in flowers was the result of the collaboration of three leading figures in their respective fields in England in the first half of the 18th century: the artist Pieter Castels, the engraver Henry Fletcher and Furber himself. 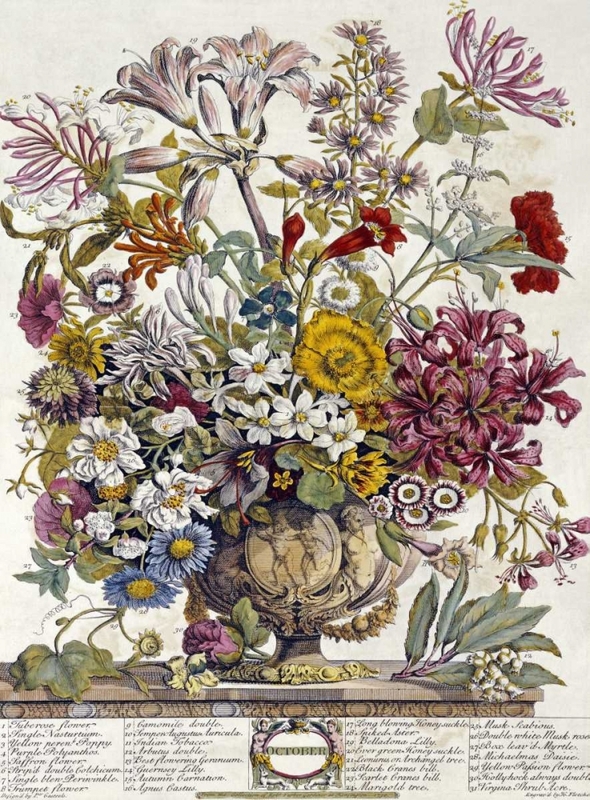 It was originally undertaken as a commercial venture in order to sell bound sets of handcoloured engravings to a group of subscribers, but the collection also existed to serve as a showcase and seed catalogue for Furber’s own nursery. This was the first commercial horticultural catalogue of its time. One engraved plate was made for every month of the year, consisting of an appropriate arrangement of flowers in a vase. On each print the individual plants were numbered and identified in a list at the bottom, and over 400 species are depicted throughout the series. The plates were advertised first in 1731 in Fog’s Weekly Journal and the collection is one of the largest and earliest sets of coloured engravings in the history of English printmaking."